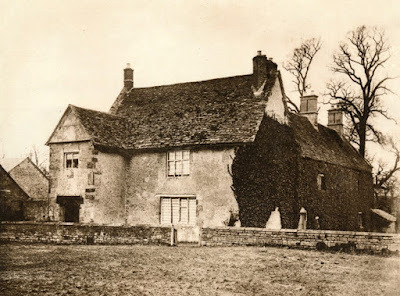 In March 1917, John Glessner received an invitation to help fund the restoration and preservation of Sulgrave Manor, the ancestral home of George Washington in Sulgrave, Northhamptonshire, England. Although there is no evidence that Glessner did make the requested donation, other members of his family later did. In this article, we will explore the history of the site, the efforts to preserve it in the first decades of the 20th century, and its status today. Sulgrave Manor was constructed in 1540 by Lawrence Washington, the five times great-grandfather of George Washington. 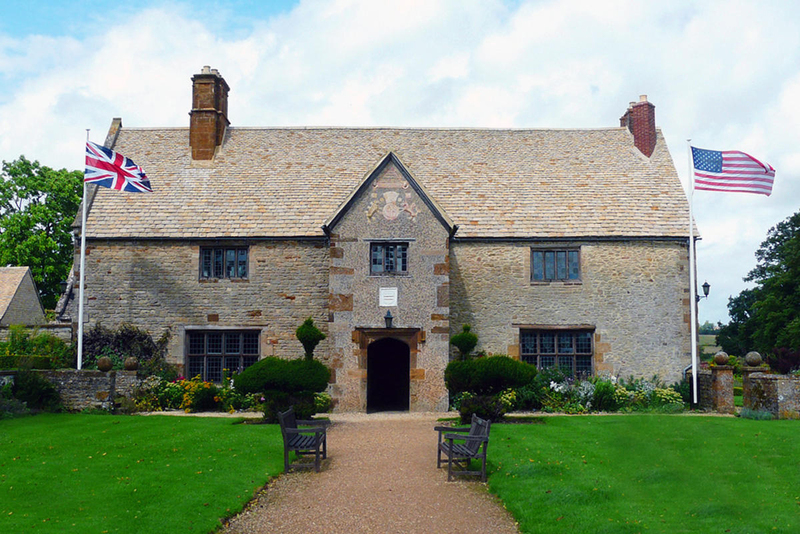 The entrance porch was completed soon after Queen Elizabeth I ascended to the throne in 1558, and her coat of arms and initials were fashioned in plaster work upon its gable. Just above the door is the Washington family’s coat of arms carved in stone. 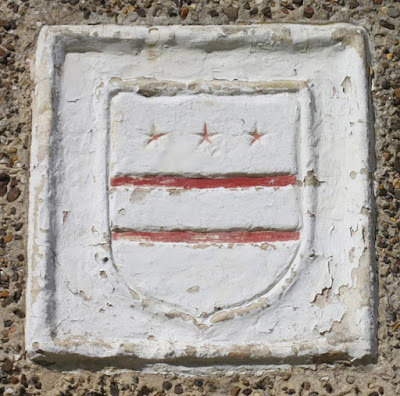 Known as the “mullets and bars” with three stars over two stripes, it is widely believed to have served as the inspiration for the American flag. The house, constructed of a local limestone, was occupied by Lawrence Washington, his wife, and their eleven children. 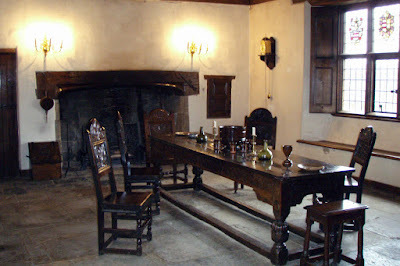 As was typical for Tudor houses, the center of the house was the Great Hall, which still looks much as it did in its day, furnished with authentic furnishings of the Tudor period. The complex included courtyards, walled gardens, grass paddocks, and various outbuildings including a barn, brew house, buttery, and shop. Descendants of Lawrence Washington continued to occupy the house until 1659, when they immigrated to America. By 1700, when John Hodges added a north wing, the western portion of the house (to the left of the entrance porch) had already been destroyed. 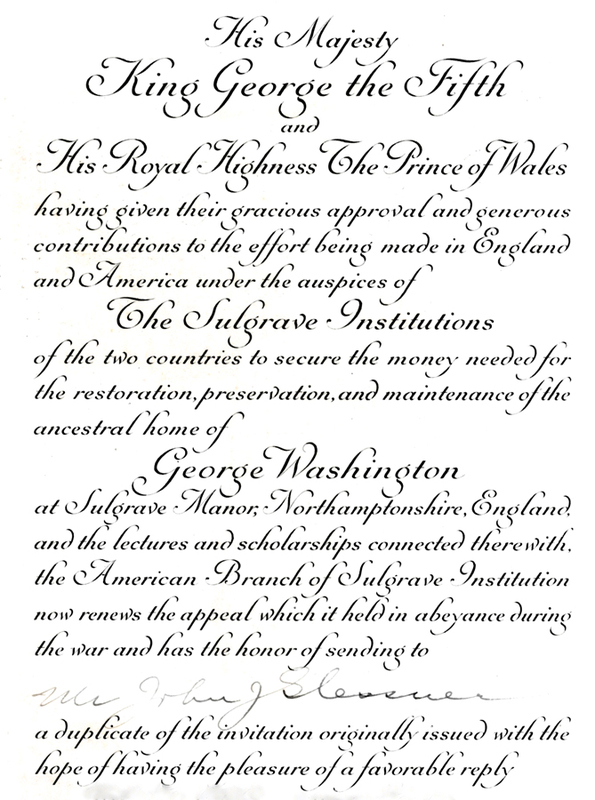 “The first formal ceremony in honor of the one hundred years of peace between the English speaking nations occurred here today when Sulgrave Manor, the home of the family of George Washington, purchased for $42,500 subscribed in Great Britain, was handed over to members of the centenary committee as a gift to the American people. “This quaint village was in holiday attire in honor of the occasion. 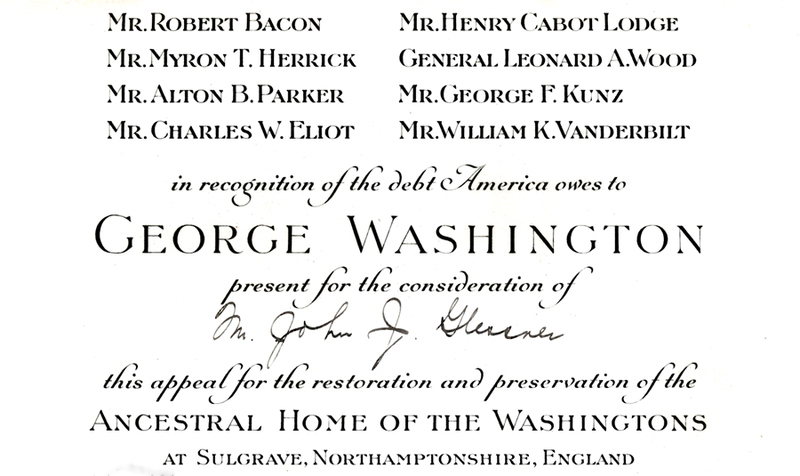 The visiting party consisted of the American ambassador, Walter Hines Page, the Duke of Teck, Lord Shaw, Shirley Benn, member of the house of commons; H. S. Perris, secretary of the committee; Harry Brittain, secretary of the Pilgrims’ society, and Arthur Branscombe, author of the history of the Washington family. They were greeted by the mayor and other officials of the municipality, in their official robes, after which school children sang the national anthems of both the United States and Great Britain. The timing of the ceremony is of note, in particular because it was commemorating a long period of peace. Just ten days later, Great Britain declared war on Germany, and the country was thrust into the horrors of World War I. 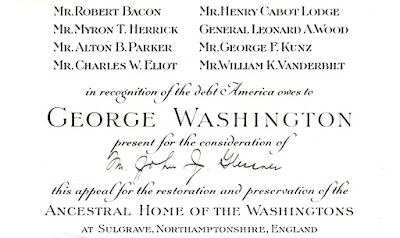 This necessarily delayed the planned restoration of the house, but by 1917, invitations were sent out soliciting donations of $250 each from 200 individuals to complete the needed work. The committee included such prominent individuals as statesman Robert Bacon, historian and Senator Henry Cabot Lodge, philanthropist William K. Vanderbilt, and Charles W. Eliot. Eliot has served as the president of Harvard University from 1869 until 1909, and was a close friend of the Glessners. Presumably John Glessner received his invitation because of this connection. The fundraising effort was put on hold when the United States entered World War I on April 6, 1917. A second solicitation letter was sent out in December 1919, this time with an added appeal from King George V and the Prince of Wales inserted. The request had been altered to asking 50 individuals for $1,000 each. Once the funds were secured, the house and grounds were restored under the supervision of the imminent English architect and landscape designer Sir Reginald Blomfield. Work included the rebuilding of the west wing, which had been destroyed in the 17th century; the new wing included the Director’s quarters, and restored the symmetrical appearance of the façade. (One can’t help but notice that the symmetrical façade, set beneath a broad sloping roof, bears a similarity in overall massing to Glessner House; see image below). The house was officially opened to the public in 1921, with the flags of Great Britain and the United States both displayed. 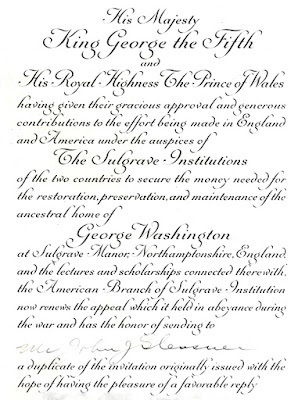 In 1924, the National Society of the Colonial Dames of America raised $112,000 from 35,000 subscribers to endow the Manor and grounds in perpetuity. It is highly likely that Frances Glessner was among the subscribers, as she became a member of the Dames in 1921. Funds for further restoration were raised between 1926 and 1931, and Alice Hamlin Glessner, the Glessners’ daughter-in-law and an active member of the New Hampshire Society of the Dames, was among the funders for that project. Modern images of Sulgrave Manor courtesy of the World Monuments Fund.